The Bretford 36-Unit MDM charging cart is designed for tablets as well as Chromebook and Ultrabook computers. Quality and Effectiveness: The charging cart comes preassembled. When we received it, we only had to readjust the separators that fell off during delivery. The reviewer used the cart for eight laptops (15.6” screens) and six Chromebooks (11.6” screens), but the cart has enough slots for 36 devices. The cart can accommodate device sizes ranging from large-screen laptops to smaller tablets. Ease of Use: Users can easily fit all of the cords and chargers into the back of the cart and thread the cords through the holes to charge up devices. It is very simple to pull a device out of the cart and place it back after use. Creative Use of Technology: This charging cart is perfect for campuses that have multiple devices, such as Dell laptops, iPads, iPad minis, Chromebooks, tablets, or e-readers. Our curriculum department was able to secure the computers by locking them up and could easily roll the cart to other parts of the building without damaging the devices. 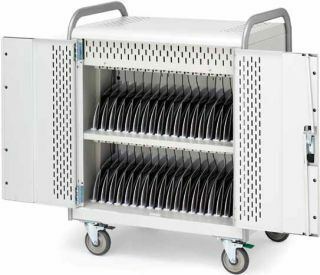 Suitability for Use in a School Environment: The fact that this cart can charge many kinds of devices makes it perfect for BYOD and multiple-device environments. This cart could even eliminate the need for a computer lab since it can hold up to 36 devices, which frees up space and funds. • Allows greater teacher involvement by allowing teachers to bring their devices to their classrooms rather than taking the students to a computer lab. • The Power Manager is designed to charge a full cart of laptops using only one wall outlet. The system constantly re-evaluates the demand for power and concentrates on the devices that need it the most, adding power strips as battery demand drops, until all devices are charging simultaneously. This cart can be helpful for both district training and classroom environments. The cart’s durability and mobility make it ideal for today’s dual-use training/classroom spaces. The cart is a great solution for multiple-device environments.